More and more, the new volume of Uncanny X-Men has been a throwback to the very first days of Xavier's children of the atom. 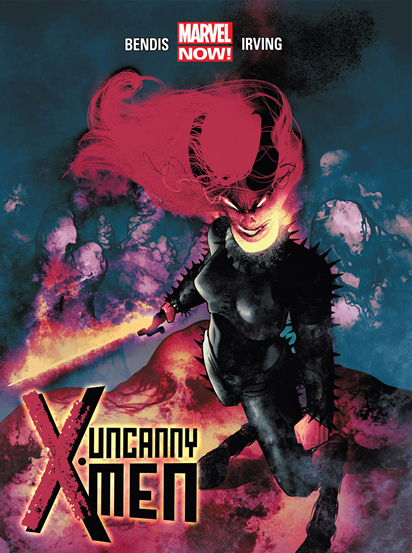 Mutants young and old are thrown into a world of heroes and villains, struggling to take control of a force within each one of them that they are yet unable to control. But more than that, they are fighting for a chance to be seen as equals and to, in their own way, assure their version of the Professor's dream. Uncanny X-Men #7 starts with a scene that is obviously from a time after (or before) the debacle with Dormammu's invasion of Limbo. We find that Magik has found the consult of Doctor Strange, whom, as we quickly learn, has no idea who she is. As she recounts the events that happened since the end of the last issue, we see bit by bit how truly unprepared Cyclop's team is for the reality of what they are facing. Bendis sets up the scene extremely well, meshing conflict, near-death experiences, and feelings of helplessness and inadequacy into a picture that hits home. The message is amplified by the fact that the artwork in this issue harmonizes perfectly with the feelings conveyed. Irving's penciling is dramatic and emotional. While it's not what we traditionally see in comic books, Irving's work is a welcome addition that shows the raw emotion that's charged into these pages. I am especially impressed by the portrayal of Doctor Strange in this issue, as it is a tribute to a look Doctor Strange has not seen since the 60s. Speaking of which, as a fan of the good Doctor myself, I am quite pleased to see him take on more and more important roles within the current Marvel Universe. In my opinion, he has long been a neglected character that was annoyingly "depowered" due to the fact that writers didn't know what to do with his previous deux ex machina status. Though Bendis has historically been one of the writers to botch the writing of Doctor Strange, I sense a return to the golden days of Doctor Strange in the future, and it might as well start with him going back to square one and teaching Illyana a thing or two about what it truly means to wield magic. I'm hoping that Bendis doesn't screw this up for Strange, and, luckily, he has yet to do so in his current run with the character.